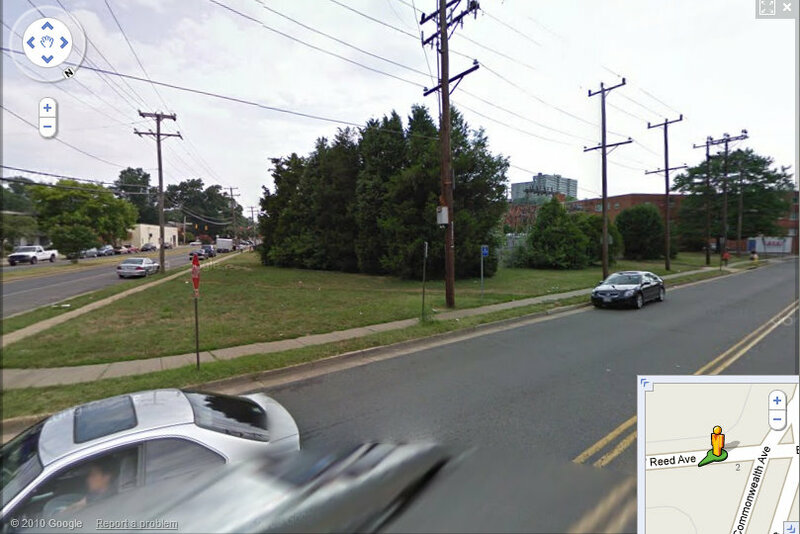 When the City of Alexandria purchased 3550 Commonwealth Ave from Dominion Power, they had Open Space funding available and a goal of expanding park space, but they didn't really have a plan for it. That wasn't a bad thing -- just removing the blighted, out-of-use electrical substation on the property and planting grass in its place was an aesthetic improvement -- but it left a blighted, vacant lot. While various options for the park remain open (in previous posts we discussed a fenced in dog park), in the interim, a team of volunteers decided last year to start the process of turning the property around by installing a large garden on one corner. 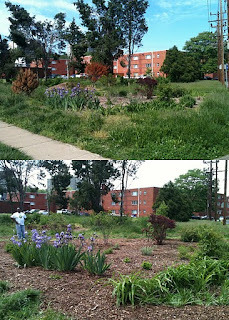 For just $200, using garden cast-off plants donated by neighbors and mulch from cut-down, unhealthy, storm-battered trees formerly used to screen the old substation, it started to resemble a park. Throughout the clean-up visitors and onlookers made several commitments to the park. Parks staff, seeing the derelict state of the remaining evergreen trees, said the City would remove the rest...and mow the site more regularly since the garden is being hidden behind an 18" wall of grass and weeds. The outgoing City Manager and his interim replacement said they would find a little money in the budget to come up with a landscaping plan. I guarantee that would not have happened if neighbors hadn't devoted time and energy trying to make something of the site. The City sees and appreciates the effort and wants to leverage the volunteer support with a little funding. View of former electrical sub-station that became the park. It shouldn't be forgotten that without these volunteer efforts, the stalled park improvement might have continued the decline into blight. We know that cleaning up the site has already improved safety: Last year, when volunteers were removing some of the trees on the site and thinning out the bottom branches of others, a woman expressed her gratitude for making the area feel more secure. She relayed the story of having her purse stolen by an assailant who had hidden among the trees and attacked her when she was waiting for the bus. So thank you, Spring for Alexandria team. With your help, we'll make a park of this otherwise unplanned site, yet!